Meeru Island Resort :: View topic - Our Wild West Adventure. Meeru Island Resort Forum Index » Trip Reports from anywhere else in the world! » Our Wild West Adventure. Having been to Meeru 3 times we really wondered whether anything else would come up to our expectations, but with rising costs we finally decided to do something different. Back in 2001 weâ€™d done a fly drive around Arizona and thought it would now be a good time to revisit and see other areas of the USA. We travelled as 2 couples from Newcastle to Heathrow and onto Denver Colorado with British airways. The flights were on time, the service was fine and the time soon passed. We spent our first 2 nights in Denver staying at the Comfort Inn Downtown. It had a good location for the 16th Street Mall, a long pedestrianised street with a hop on hop off courtesy bus running the full length. There were lots of shops, bars and restaurants and dotted around on most corners were brightly painted pianos for anyone to step up and play a tune. Some pianists were very good and some not so good to say the least, but it brought a smile to your face anyway. We then picked up a car, a large Chevrolet Suburban, very comfortable and with the seats being high up, it gave us good visibility for the sights to come. Seeing places weâ€™d only seen on old cowboy films like Cheyenne, Cody, the route of the Deadwood stage. Real cowboys rounding up their herds, Indian Reservations, it was like a step back in time. 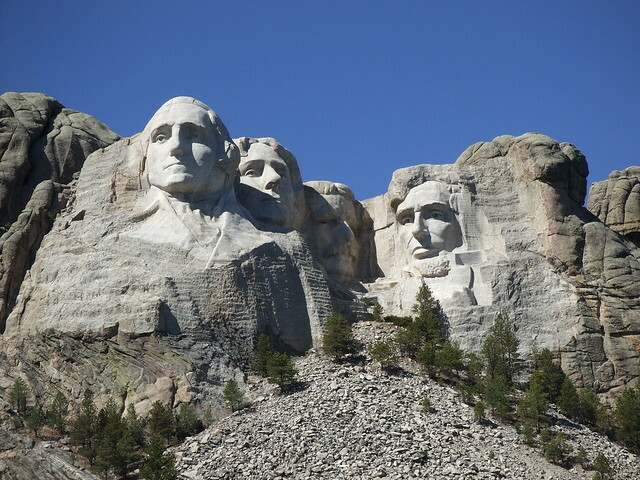 Mount Rushmore: - Nowhere seemed to rip you off in respect of entrance fees or being forced to walk through a gift shop before you got to where you wanted to be as at some places. It was only $10 per car to park and visit the monument which we felt was a bargain. Very impressive. Site of the Battle of Little Big Horn - Custerâ€™s Last Stand:-. Again only $10 per car entrance. It was a damp, drizzly day and it seemed to add to the atmosphere of the place. It was very moving to see all the markers spread over a huge area of several miles, showing the spot where the men had fallen, some in large groups and others quite solitary. There are touching memorials to the soldiers, civilians, Native Americans and even the horses who fell there. One of our highlights was when we just happened to turn around and see a herd of wild horses galloping down the hill, their tails and manes flowing, they came to a halt and we were able to get a photo of them before they moved on again. Wyoming: - The scenery was amazing. You canâ€™t even describe the wide open spaces, just mile upon mile of prairies as far as you could see. Lots of Antelope and herds of Deer and cattle. 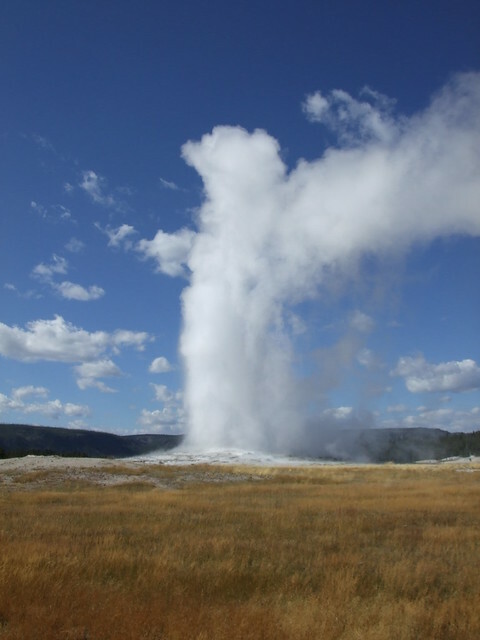 Yellowstone Park & Old Faithful: - Unfortunately due to time constraints we only had one day here. Slightly disappointed at the scenery here. I donâ€™t know if it was only the small section of the park we managed to see, but there had been a lot of fires there recently and a lot of the trees were just burnt sticks. Also the majority of trees were pine trees or similar so we didnâ€™t see much here in the way of the vivid â€˜fallâ€™ colours that we saw elsewhere. But that said, we are really glad we went and got the chance to witness Old Faithful erupt. 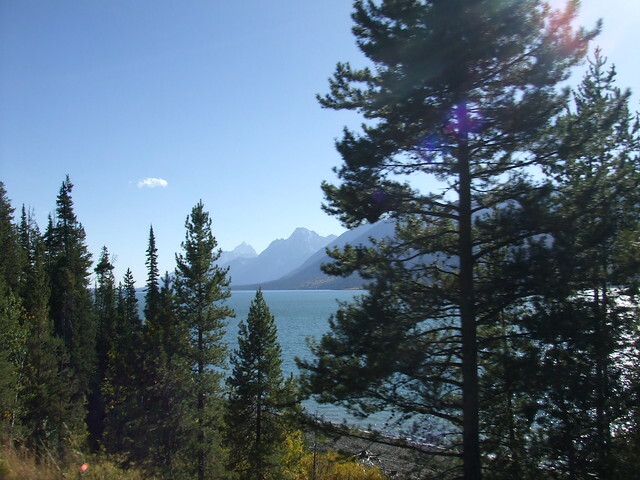 Grand Teton National Park: - Stunning! The scenery again was amazing in such a different way. The colours of the trees and lakes were fabulous and Iâ€™ve never seen such jagged mountain peaks. We saw a lone Moose here stood in the water at the edge of the lake and jumped out of the car to watch him for while, it was so quiet and serene. Jackson: - We had hoped to stay in Yellowstone but there was no accommodation available. This was a problem we found throughout the whole of the journey, everywhere seemed booked up so beggars couldnâ€™t always be choosers, but we always managed to find somewhere in the end and were never disappointed. Most of the motel/hotel staff we talked to throughout our travels were surprised themselves how full everywhere was and said they didnâ€™t know why and that it was unusual. Jackson was no different. We eventually, after trying for an hour to find somewhere to stay, found a small hotel on a side street, the only place we felt we paid over the odds for at $130 per room opposed to an average of $79 that we paid most other places, but it was extremely comfortable and clean. We found a bar called the Million Dollar Cowboy Bar and had a fantastic night there. The bar stools were actually cowboy saddles. They had a live country band and the local cowboys, young and old, took to the dance floor, they could certainly dance, we were worn out watching them. A good night was had by all. 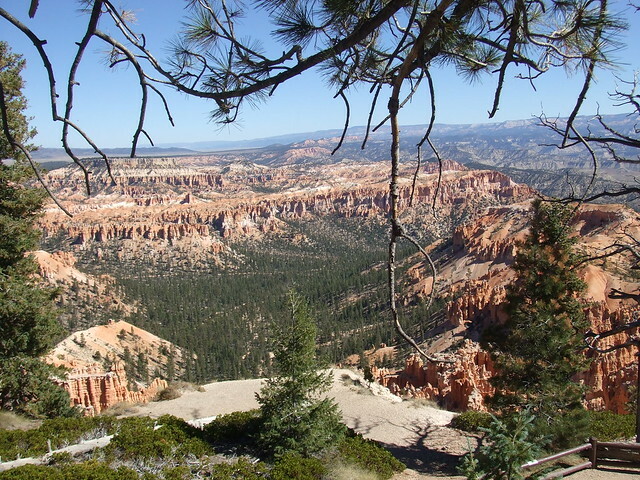 Utah: - Red Rock Canyon, Bryce Canyon and Zion National Park, Iâ€™m sorry to rabbit on about the scenery again but it was breathtaking. The colours and the rock formations were unbelievable. The elevation at one point in Bryce was over 9000ft and to look down on all the weird shapes of the rock formations, as far as you could see was something weâ€™ll never forget. For $20 for the 4 of us, we got entry to the park and a hop on hop off shuttle and also another free guided tour that lasted 3.5 with a very knowledgeable guide. Unlike Bryce where you looked down on everything, Zion was the opposite, you ended up with a stiff neck looking up at the rocks. Here you couldnâ€™t take your car in you have to take the shuttle, but again the driver gave us lots of information about the different formations etc. But what a strange place Utah is in respect of the licensing laws. We knew that it might not be as easy to get a drink here, but it seemed to vary from town to town. Some restaurants sold alcohol, some sold none at all and some limited you to 3 glasses of whatever you were drinking and you could only buy another drink when all the glasses in your party were totally empty! Las Vegas: - We dropped the car off here and had 4 nights staying at the Paris Hotel. We upgraded our room at a cost of $55 per room per night but this gave us a view of â€˜the stripâ€™ and access to the lounge on the 31st floor which served complimentary breakfast, light evening snacks like sandwiches, prawns, pasta, deserts etc and a bar. The price of the upgrade more than paid for itself in this respect. On a previous visit weâ€™d flown over the Grand Canyon on a small plane and then another time travelled by cowboy train and stood on the edge of the rim, so this time we decided to take a helicopter flight and land at the bottom of the Grand Canyon. We couldnâ€™t believe it when we got up that morning that it was actually raining in Las Vegas, proper heavy rain, but by the time we got to the airport for the helicopter it had stopped and was really hot again. What it did mean though was that the Colorado River was a deep chocolate colour. The pilot told us that after any rain it turns this colour and it takes 3.5 weeks of no further rain for it to turn back to blue again. This was our 3rd visit to Vegas, the last time was 9 years ago and itâ€™s certainly changed a lot. There was a lot of building work going on with many more tall, modern hotels, not themed hotels like Paris or the Venetian etc. which in our opinion was a shame as we liked the feeling of â€˜unrealityâ€™. It was much more expensive compared to other places, a glass of wine was between $6 and $11 and a small beer $6. On â€˜the stripâ€™ there were lots of people trying to thrust graphic cards advertising â€˜hot babesâ€™ into your hands which were subsequently strewn across the pavements, not nice. I donâ€™t remember it being like that before, but if it was it wasnâ€™t as â€˜in your faceâ€™. It sounds as if we didnâ€™t enjoy it but to the contrary, we really enjoyed our time there but probably wonâ€™t go back, but then who knows, never say never. All too soon it was time to fly home â€“ Las Vegas- Heathrow- Newcastle. All flights again on time but due to congestion in the sky at Heathrow we had to circle for quite sometime, meaning we had a mad dash through T5 for our flight back to Newcastle, we arrived with minutes to spare! I hoped I havenâ€™t bored you too much, there is loads more I could have written about! I have put on a link to some more pics, some are a bit fuzzy as they were taken from inside the car. Wonder where weâ€™ll go next..........? A trip like this is something I have wanted to do for years and I have spent years trying to convince Diane to no avail. Nearly but not quite. Really, really interesting! The geography of the US, especially on the West side has a huge pull on me too. One of the big to-dos. We've mulled on the best time of year to go. Pam's got a thing about seeing Virginia in the Fall. Virginia is about one continent's width from Yellowstone so we've some conferring to complete sometime . 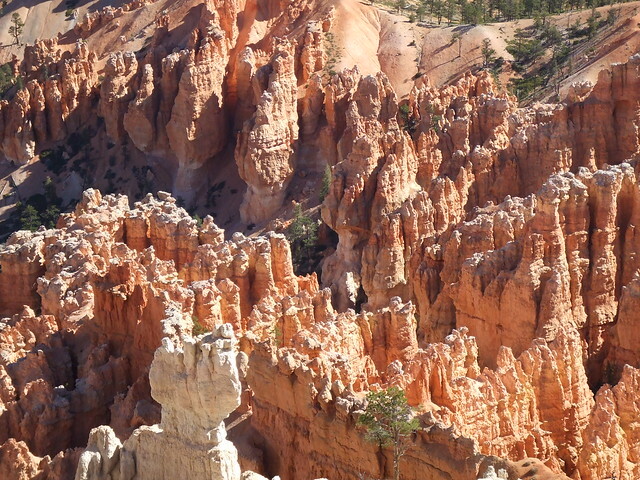 Also loving the pics, the canyon ones especially..amazing rock formations. You'll have to twist Dianes arm and give it a try, it is certainly a holiday to remember, but you might need a holiday to get over the holiday! Looks fantasitic would love it but like other would struggle to get OH on board. Shame we don't have any friends who like different holidays that way I am sure OH would be on board but most of our friends like the boring Europe hols 2 weeks in the summer. So glad to see the Hillbillies had a good holiday, nice photo's. Glad to see that you've come to your senses though and will be returning to Meeru instead of galavanting around the USA. Why no mention of the close encounter with law enforcement? I really enjoyed reading your trip report. I've only ever been to New York but I'd love to see some of the places that you've posted about.